Most of us know it’s socially inappropriate to brag on yourself. Can you believe the arrogance? one person might whisper to a friend upon hearing a lecturer or a politician glowingly tell of her accomplishments. Keeping from verbally praising yourself is a trait rooted in this verse, “Whoever exalts himself will be humbled, and whoever humbles himself will be exalted” (Matthew 23:12). Jesus knows the root of bragging, exalting is a desire to be viewed as superior. But that’s exactly what Jesus is saying about Himself in the verses above? Why are His words not bragging? First He was not talking about His works of healing, feeding thousands or raising someone to life. He didn’t list His wonders and miracles, like politicians often do. Instead, His actions proved He was God. 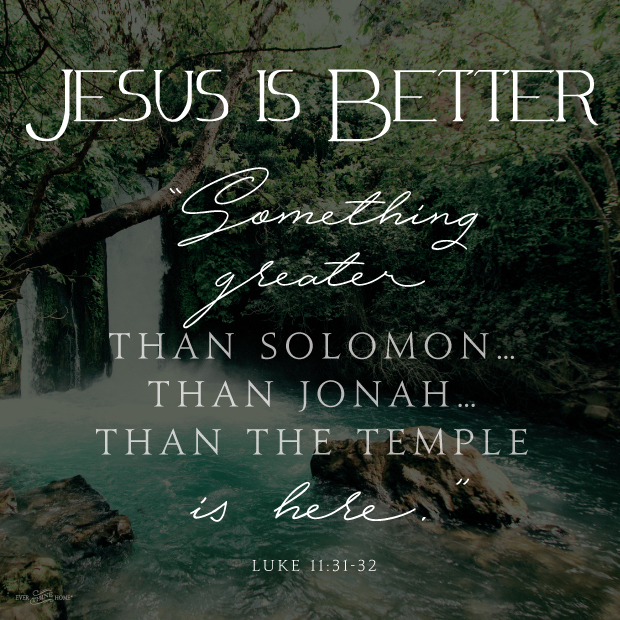 Second His comparisons to Solomon, Jonah, and the great temple in Jerusalem were intended to simply and factually say to His listeners: those people and institutions you admire and trust are inferior. All humans except Jesus are flawed by sin. Even the temple and its religion. 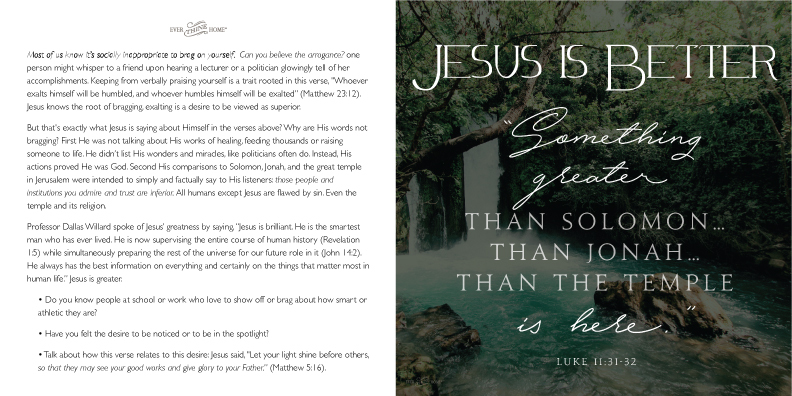 Professor Dallas Willard spoke of Jesus’ greatness by saying, “Jesus is brilliant. He is the smartest man who has ever lived. He is now supervising the entire course of human history (Revelation 1:5) while simultaneously preparing the rest of the universe for our future role in it (John 14:2). He always has the best information on everything and certainly on the things that matter most in human life.” Jesus is greater. -Do you know people at school or work who love to show off or brag about how smart or athletic they are? -Have you felt the desire to be noticed or to be in the spotlight? -Talk about how this verse relates to this desire: Jesus said, “Let your light shine before others, so that they may see your good works and give glory to your Father.” (Matthew 5:16). Amen. JESUS is Greater. Thank you. So, so good & true!! !